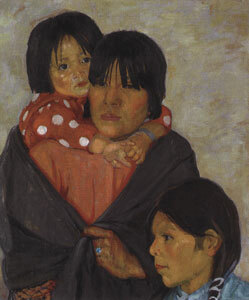 Catharine Carter Critcher, Pueblo Family, 1928, Oil on Canvas, 30" x 30"
Catharine left Virginia to study at the Cooper Union School of Design in New York in 1890, and the following year she studied at the Corcoran School of Art in Washington, D.C. She established herself as a painter of formal portraits in the DC area where she remained for over a decade until she went to Paris to study at the Academie Julian, a magnet for some of the finest American painters of the time. In 1905 she established the Cours Critcher, an art school whose aim was to help American students get into French schools of art. At the same time, she offered her services as a guide for American tourists on the Grand Tour of Europe. She was also president of the American Women Painters in Paris. In 1909 she closed the school in Paris and returned to the United States. From 1911, when she exhibited at the Paris Salon, until 1917, she taught at the Corcoran where she had been a student. In 1924, Catharine and sculptor Clara Hill opened the Critcher School of Painting and Applied Arts, which she ran until the 1940s when she decided to devote herself full time to painting. Catharine died in Virginia in 1964. Catharine Critcher was known for her portraits as well as landscape, flower, and figure paintings of subjects in Mexico, Canada, France, New England, and the American Southwest. Her first trip to Taos, New Mexico, was in 1922 and it impressed her very much. The area and its people brought her back to paint for several successive summers. 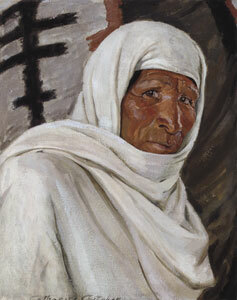 Catharine Carter Critcher, Indian Mystic, Oil on Canvas, 22" x 18"
In 1915, the Taos Society of Artists had been started by Bert Geer Phillips, Joseph Henry Sharp and Ernest Blumenschein, as well as Oscar E. Berninghaus, E.I. Couse, and W. Herbert “Buck” Dunton. They formed the Society primarily to promote their work through traveling exhibitions. In order to be considered for election to the Society, artists had to have painted in Taos for three consecutive years demonstrating their true interest in the area. In 1917, Walter Ufer, Victor Higgins, and Julius Rolshoven were elected to membership. Catharine Critcher and E. Martin Hennings were eleceted in 1924, and Kenneth Adams in 1926. Critcher was the only woman elected to be a member of the Society. In 1928, she traveled to Arizona and spent two months painting on the Hopi Indian Reservation. Her portraits of Native American subjects are insightful and are perhaps more honestly so than the society portraits for which she was known in the East. Her portrait Indian Mysticrecently brought $254,500 at a Sotheby’s auction in New York. The mystic gazes intently at the viewer with only his face exposed in the white ceremonial blanket in which he is wrapped. The linear pattern of a weaving hanging behind him appears to be a dagger plunging into his back. Critcher’s portrait recalls paintings by Robert Henri of Indian girls in white blankets. Henri had been invited to be an honorary member of the Taos Society of Artists in 1918. 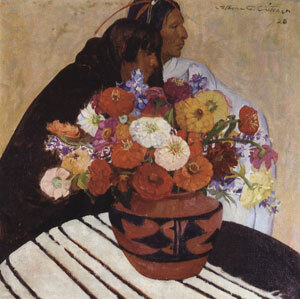 Pueblo Family, in the collection of the Eiteljorg Museum of American Indians and Western Art in Indianapolis, Indiana, is a brilliant melding of the influences in her life and the lives of the people she painted. A huge bouquet of colorful zinnias and other flowers overflow the rim of a Pueblo pot. Paintings of abundant common blossoms were a staple of still life painters of the period. The pot rests on a table whose forced perspective recalls Cezanne. The male and female Indian figures are partially obscured by the bouquet and nearly two-dimensional. This is a painting of the blending and, perhaps, the conflict, of cultures. 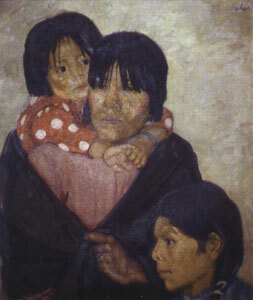 Juanita Lucero and Her Children, also in the Eiteljorg collection, is a more conventional triple portrait with the faces descending on the diagonal and facing in slightly different directions. The painting now appears as Catharine Critcher painted it, having recently been conserved. Conservation is an art and a science. Layers of dirt, discolored varnish, tears, and flaking paint receive the careful attention of the conservator. The enzymes in saliva can dissolve surface dirt. Chemical analysis will reveal whether or not aged varnish can be removed without harming the paint surface beneath. Areas of flaking paint can be consolidated and “in-painted” to recreate areas of original color. The work is imperceptible to the eye but is readily distinguished from the original paint using various scientific techniques. The paintings of Catharine Carter Critcher are beginning to emerge from undeserved obscurity to gain their rightful place among the best of Taos Society paintings. Juanita Lucero and Her Children has emerged from its own visual obscurity to lead the way.